I don't even know why I dislike it so much. Moving to a big city away from my home town should have helped. Now I can go to the store in my sweats with no makeup and bad hair and no one will know me so they don't care. In the town I grew up in, I would know every other person and it was a nightmare. So, moving three years ago should have improved my attitude on grocery shopping. It didn't. Then I get this enewsletter from Kraft saying they have a "One Bag, Five Dinners" solution...I was interested. The basic concept is that you buy a short list of ingredients (all available on a handy-dandy print out and, of course, mostly Kraft brands) and you take the list to the store - you get a week's worth of easy-to-prepare semi-healthy meals with only 10 minutes of shopping and a few ingredients. For example, instead of two different recipes requiring two different dressings as ingredients, BOTH recipes use the SAME dressing, reducing the number of items bought and saving precious fridge space (SCORE!) Pure genius! My conclusion: This is great!!! Listen up grocery stores - you should follow suit and do this one your own - just gather the ingredients and have the bags available BY THE CHECKOUT. Then market the heck out of it. I'm by no means rich, but both my husband and I work outside the home and time savers are often worth the added expense. I would pay a premium or surcharge for them to do this for me! Peapod an other grocers don't deliver to my house (shame, shame). I wish they did. But they don't. So help me out - after a long workday of 10 hours away from my little man (and my big man) I just want to BE WITH HIM - not at your store. Pre-bagged stuff would make my life easy. I beg you. Listen and help. Paper (well, cloth) or Plastic? My younger sister runs a daycare and is expecting her third child. Tonight we had a discussion about diapers, and if anyone knows diapers, she does. Carter is only 5 months and I never really babysat so I defer to experts here. I've been reading about different types of diapers out there and although I would love to be greener and do my part in making the world a better place for my children and future generations, I have to admit that chucking the Pampers Swaddlers into my Diaper Champ and calling it a day is pretty easy. But it's still expensive. Diapers run upwards of $0.20 each. Carter doesn't complain when he's wet or dirty, but that doesn't give me permission to let him sit in it. So we change him. That's the right thing to do, right? I'd be curious to know how often other parents change their babies. We go through 6-8 diapers a day. Is that normal? They've done away with pins and all the old fashioned stuff that made them hard to use. And, these things are now a fashion statement! Now despite being cute, these things DO require insert "refills" as they aren't cloth - they have flushable liners. That sounds good - unsnap, drop in the toilet, swish until dissolved and flush the smelly messy stuff right away and the plastic doesn't end up in the landfill! But...the liners are expensive. More than $0.40 each. That's double what the disposable diapers cost! But, there's no laundry (except for the outer diaper but not every change...maybe shell a day?) Oh, and they must have read an email from someone in my mom's group recently - she was begging for ideas on how to get her child to stop taking off his dirty diapers and smearing...it...all over her walls (the horror!) G-Diapers fasten IN THE BACK! Ha! Take that, terrible two! The diapers are about the same price as the g's for the outer shell (about $18) and the liners run about $4 each...but they are meant to be washed for reuse. BumGenius has a 14-day return policy (my sister said...I have to verify) so if I don't like them, no harm done, right? 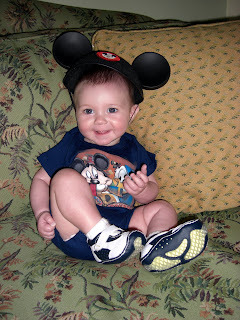 Now, I'll admit that I am NOT a nervous parent when it comes to exposing my baby to things. I washed his clothes in Dreft the first two weeks. I figured someone would report me for child abuse if I didn't. But that was a lot of work, so then I washed his clothes with our clothes in Dreft for another week or so. After about 4 weeks, his clothes were washed with ours in regular *gasp* scented detergent and he never had a rash or bumps or anything. He doesn't seem to mind, and neither do I. Now, the wash instructions on the BumGenius website are pretty...complicated. How much money will I save overall if I have to watch these inserts 3 TIMES? So, my plan is: I will buy a starter pack of the g-diapers and a BumGenius 3.0 or two with some inserts and try them both out. I'll keep my Swaddlers nearby for when we are on the road or if I need added convenience. Or if I just decide the heck with all of this! But, if I am already spending about $45 a month on disposable diapers, I figure one-month investment to try to save the environment a little bit is worth my own sanity. Blog Driver: Move That Blog! I had been posting my blog under my old blog address which was just a personal address, but since re-focusing the content and figuring out what I am doing, I decided to create a new blog name that matched the title of my postings - Spunky Mommy! So...I'm moving this blog! From now on you'll see content here! Can't wait for the next real entry - and thanks for reading! I'll be the first to admit: I don't like other people's bratty children. I think that's why I waited so long to have a child of my own - I was really afraid s/he would become a brat. As they say in Willy Wonka, it's all the parents' fault and I didn't want the blame! 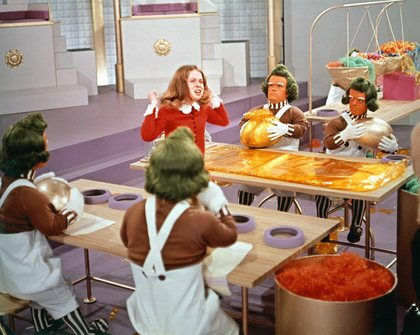 "I want an Oompa Loompa now!" We have a couple of years before we figure out what Carter will be...but so far, so good. Fingers crossed. Best: 4-year-old Alisa from Vermont hugging me and Henry when we got off the plane. Best: All the little children who stopped to smile and talk to Carter in his stroller. Worse: The little punk (about 8 or 9) who really tried to trip both me and Henry as we walked through Africa in Animal Kingdom with Carter and thought it was funny. I'll keep you posted on other good/bad sights!! 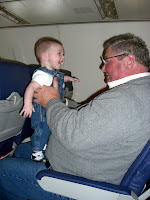 We took Carter on his first flight ever and he was a champ. 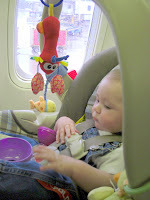 He got really bored about half way through the flight on the way down (but that's understandable - I was bored too). But air pressure didn't phase him in the least (yeah!). To pass the time, we passed him around! Now, I want to say that Disney isn't for everyone. Including my husband. He was a sport but he was bored out of his mind. Without a child old enough to enjoy what was happening around him, he was miserable. 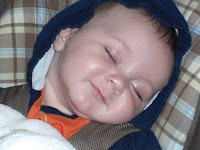 Every time we tried to go on a ride, Carter seemed to fall asleep. That's a five-month-old for 'ya. At least he smiles in his sleep! In just a few short years Carter will want to go on rides with us, and a few short years later he won't want to go anywhere with us, so I'm enjoying every moment I can NOW. Poor Henry was B-O-R-E-D though. I won't go into a long description of every moment of our trip, but it was magical in its own way. It was wonderful to spend time with my parents and give Carter the opportunity to be spoiled to death with all the attention of his grandparents, aunt, uncle and cousins (ages 5 & 7). And isn't that what Disney is all about? Family. Thank you!!! Here's the scoop - Carter is now 4.5 months old and just over 14 lbs (yep, he's a peanut for his age - skinny but very tall!) He's seriously bored with laying on his back. Since he was just a couple of weeks old he's wanted to "stand" and has pushed up on his legs. So, a couple of weeks ago I stood him up and let him hold on to the chair and then I let go...and he stood there. WOW! Now he's getting more daring. He's letting go with one hand and reaching for things (see photo). Seriously scary for a mom who likes the fact that her child isn't moving...yet. But, it's cute so I'll let everyone ooooh and ahhhh while I go baby-proof the house. Well, not ever, since I've posted on MySpace before, but I don't think that counts. So...I'm a newbie here! I have to thank my friend Jen (http://www.azureindigo.com) for her BLOG inspiration - I am always checking it out to see what's up in her life. At least 10 times a day I think "that would make an interesting subject..." but I haven't gotten around to signing up...until NOW!